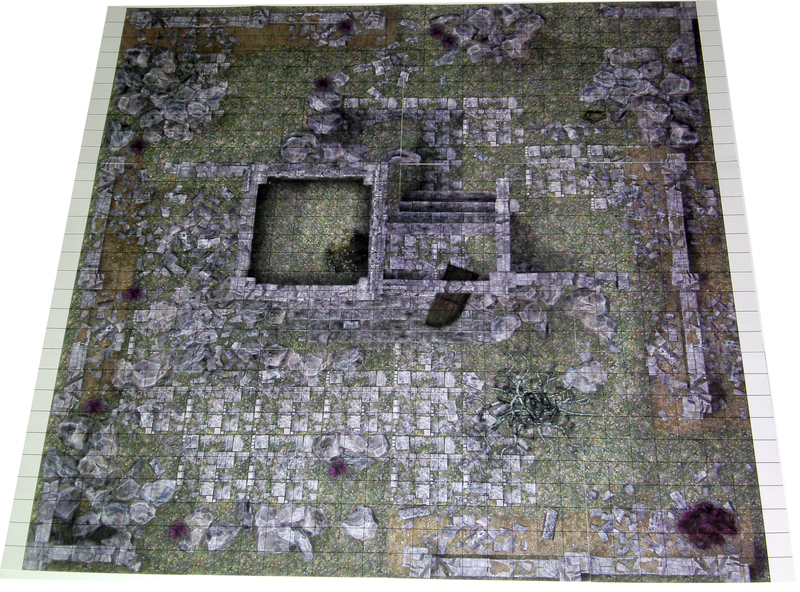 This Product is a 32 x 30 inch, full color floorplan of a Courtyard Ruin. It comes with Square, Hex and No Ovelays and includes the VTT files for online use. The Print on Demand version has the Courtyard Ruins Square Overlay on one side and the Castle Ruins top level square overlay on the other, you get two maps in one Print on Demand Product. The Card version contains twelve, double-sided card tiles. Each over-sized tile is 8”x10” and printed on sturdy 12 point card stock. The UV coating on the tiles keeps them spill resistant, lets you peel transparent tape on and off them without damaging the tile, and allows you to mark the tiles with dry wipe markers then wipe them clean. As you can see in the images below, the card version has the square grid overlay on one side and the Castle Ruins top level map the other side. We recommend getting the Zip File combo as well (or at least download the PDF Preview) so you can see how the tiles all lay out. The full layout map is not included with the printed card pages to reduce their cost to you. The Courtyard Ruins is a single room map of a destroyed courtyard weathered by time. A despotic king once used the courtyard for executions. A raised wooden platform for hanging still stands here. The Courtyard Ruins can be used in conjunction with our Castle Ruins map, creating a large ruined castle and courtyard when combined. 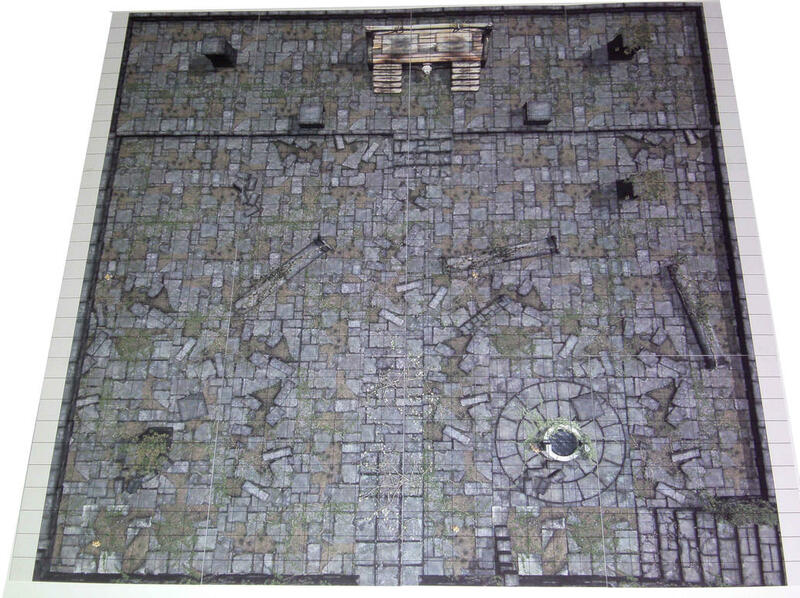 The Courtyard Ruins map is intended for use in fantasy games. It could also make for a creepy site to visit in Horror games as well as an ancient ruined execution site, likely with ghosts of those angry about their end. One adventure with the Courtyard Ruins involves a monster king who has taken over the ruined kingdom. He recently found some adventurers trespassing his kingdom and has ordered their execution. Monster criers and heralds for the king proclaim the execution loudly throughout the nearby lands. 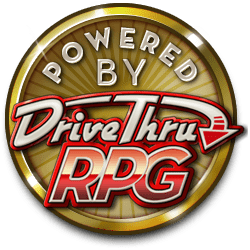 The group may hear about it that way or from a local lord who wishes to hire the group to save his captured scouts who were investigating the local castle ruins and got into trouble. When the group arrives, they find the scouts strung up on the gallows for a hanging. A monster executioner and a monstrous mob stand in the way of the group saving the scouts. Can they stop the execution in time? Will they save the scouts and help them get vengeance on the monster king in his ruined castle lair? If they can’t save them, do they avenge them by taking on the monster king themselves? The Picture below, is of the Print on Demand Version. This is the map on the flip side.